Drink & Drive in the world's most beautiful city. Through Prague's UNESCO Old Town and along the river covering the city's major sights, amazing views and lots of photo opportunities. Incl. top-rated Prague Pub Crawl© guide with excellent English. Ice-cold and free-flowing Czech premium Budweiser Budvar beer, party lights and a sound system. Feel free to bring your own music. It's 16 persons per bike but we now have two bikes so we can make it a beer bike parade to accomodate bigger groups. Longer tours, more & different drinks, custom routes and other extras are also possible–just contact us. Each bike comes with a driver. Your driver will stay sober so none of you have to. Our drivers are experienced tour guides and are happy to tell you about the city's history, architecture and local culture as well as nightlife, food and sights off the beaten path. All speak excellent English. Our bikes are brand new and the most luxurious vehicles on the beer bike market: 16 seats (10 adjustable ones with pedals), space for a driver and a barkeeper, sunroof, sound system, bar lights aaannd a super-silent electric support engine so the experience is not overly exhausting. You can drink as much as you want while we explore the highlights of a breathtakingly beautiful city. Finally you don't have to pick between sightseeing and drinking in a pub. We make sure to take plenty of breaks to tap beers, take pictures and make use of bathrooms. We can provide a pretty Prague Pub Crawl barkeeper (50 EUR), make it a Prosecco Bike (10L prosecco, 4L water for 50 EUR) or provide an extra drinks package (3L prosecco, 3L cider / soft drinks, 3L water for 50 EUR). We are also happy to accomodate all sorts of individual requests or ideas: longer tours, special routes, different drinks. Just contact us with you ideas or requests. We know about partying and you can rely on us. We run the legendary Prague Pub Crawl, the biggest pub tour in the world. Every single night since 2008. 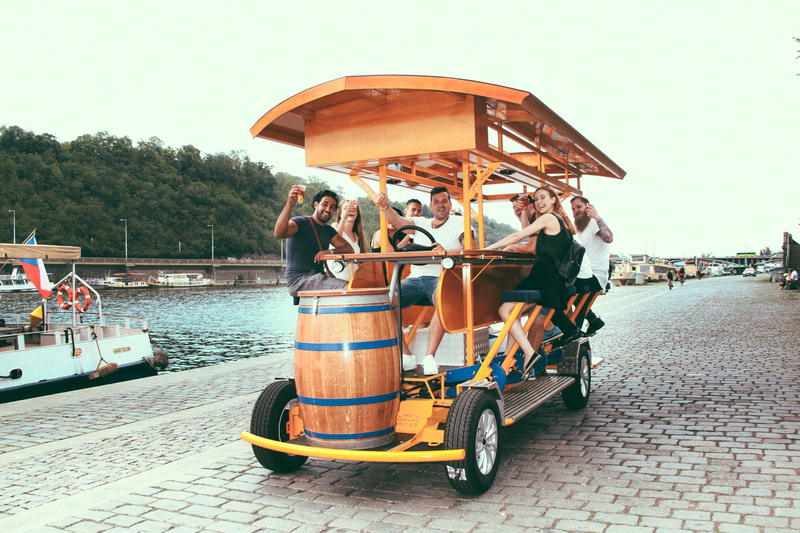 Our Beer Bike Tours are operated by the same, young, passionate, multinational team – friendly, competent customer service staff, highly-rated, charismatic guides and famously cute & quick-witted barkeepers. Celetná 558/12, 110 00 Praha 1- Old Town 2-minute walk from Old Town Square and the Astronomical Clock. We got your message, thank you! Discover Prague Tours s.r.o. - Korunní 588/4, Vinohrady - 120 00 Praha 2 - IČO: 24259217 - Spisová značka: C 197676 vedená u Městského soudu v Praze.